But you will always find me in the kitchen at parties! And that is exactly where I spent most of my Saturday. Not just at the party but throughout the day as I prepared, cooked and presented the tasty food that I was to serve at my festive banquet. When I woke up on Saturday morning (after Friday’s hair of the dog beer that then became 5 pints and a kebab!) I thought it best to make a start with menial tasks until I was fully awake and alert to go about measuring and weighing ingredients. Knife in hand and with several foil platters at my disposal I went about chopping the vegetable crudités and arranging them onto platters; putting the charcuterie onto platters. Covering the platters with cling film and into the fridge. Job done. 1st: Put all the ingredients into a food mixer and blend together until you have the consistency of coarse sand. 2nd: Then squidge a teaspoonful of this mixture into small petit four cases. I find it easier to roll the mixture into a ball before pressing it in. Approx 50 of these can be made. I didn’t use milk chocolate as I don’t normally use it for cooking so I just used 300g of dark chocolate. 3rd: Melt the chocolate by whatever method you prefer and top each of the peanut butter cups with enough chocolate to cover them. 4th: Sprinkle with any decoration that takes your fancy. I opted for green and red sugar strands (confetitos). What can I say? As camp as Christmas! I put these peanut butter cups into the fridge to help set the chocolate and to get them out of the way. The following recipes are in a previous blog titled “Nigella is for life not just for Christmas!” click on the link to take you to these recipes. I made both the spiced nuts and the cocktail sausages in advance and then put them into sealed foil containers ready to be warmed up in the evening. A couple of hours before lift off, I made the Pigs in Blankets and Pesto Palmiers. 1st: Unroll the puff pastry onto a floured surface. 2nd: Spread the pastry with pesto from a jar. 3rd: Grate parmesan cheese to cover the pesto. 4th: Hold one end of the pastry and fold into the centre. Repeat with the opposite side. Fold in half and cut into thin strips. 5th: Place cut side up onto a baking sheet. Bake at 220ºC for 15mins or until golden. 1st: In a bowl put 375g Self Raising Flour, a heaped teaspoon of salt and 20g of grated Red Leicester. 2nd: In a measuring jug add 125ml of Whole Milk, 3 tablespoons of vegetable oil and an egg. Mix together and pour the wet ingredients into the dry. 3rd: Once combined into a ball, roll out the pastry onto a floured surface. 4th: Cut the pastry into small rectangles. 5th: Roll each cocktail sausage into the blanket. For the veggie option just leave out the sausage to create a pastry cheese twist. 6th: Egg wash each blanket and bake in the oven at 220ºC for 15mins or until golden. As my guests arrived I started baking both the palmiers and pigs in blankets, whilst warming the spiced nuts and the cocktail sausages at the same time. I will say one thing though: the poinsettia cocktail (1 bottle cava, 500ml of cranberry juice and 125ml of cointreau of which there were 5 bottles of cava!) was also in the kitchen. Hence spending most of my time in the kitchen at parties! From welcome cocktail and savoury nibbles to a sweet little something at the end, I hope I’ve been able to give you lots of ideas on how to throw a Christmas Party where your guests are impressed by your food & drink and want to be invited again next year! Here’s to another great year in food. Damn! I just dropped the piece of chicken into the jar of chilli jam. Literally scraping the last few fiery flecks of sweet chilli onto the scalloped chicken breast “gallina empana” I look back, even though a few months late, at what was a highly successful seasonal cooking extravaganza. Seduced and inspired by Nigella, whom I watch avidly every December, I began my preparations to launch myself into the Christmas Spirit (or several spirits as the case may be)! I met a friend for a coffee one day to plan what food and cocktail we could make for a party of approx 20 people. She whipped out the Christmas cooking bible that is Nigella Christmas; I am almost sure but I think everyone stopped and turned in our direction! I stroked each and every glossy photo; gently fingered pages and salivated over every Christmas buffet party-clad table, and set to task. The Christmas Cocktail that we decided upon was Poinsettia – a severely quaffable fizzy wine based cocktail with cointreau and cranberry juice. Cranberry and soy-glazed cocktail sausages**, Chilli Jam for cheeses, Union Square Cafe nuts, Tuna Salad, Christmas Rocky Road and Peanut butter cups. *Gibraltarian households celebrate Christmas with spanish charcuterie – this can be a thing of magnificence; the omnipresent chorizo, the majestic jamón (Pata Negra) and the angelic salchichon. As well as Manchego cheese sliced onto plates and drizzled with olive oil. These were an absolute hit and will become a regular feature at my future parties. 2nd: Mix 125ml of sweet chilli sauce, 60ml cranberry sauce, 60ml soy sauce, 1 tbls dark brown sugar, juice of 1 clementine and juice of 1 lime together and pour over the sausages. Coat evenly. 3rd: Cook in a hot oven for 40mins with a shake of the oven dish half way through cooking. These are so lip-smackingly good that you’ll have guests asking for more! **Alternatively replace the sausages for spare ribs. I however, find that, the spare ribs even though delicious in this sauce, need an extra 10mins in the oven with some honey over to make them extra-sticky-finger-licking-good! This perhaps isn’t ideal for parties but make a great mid-week treat over a few beers. 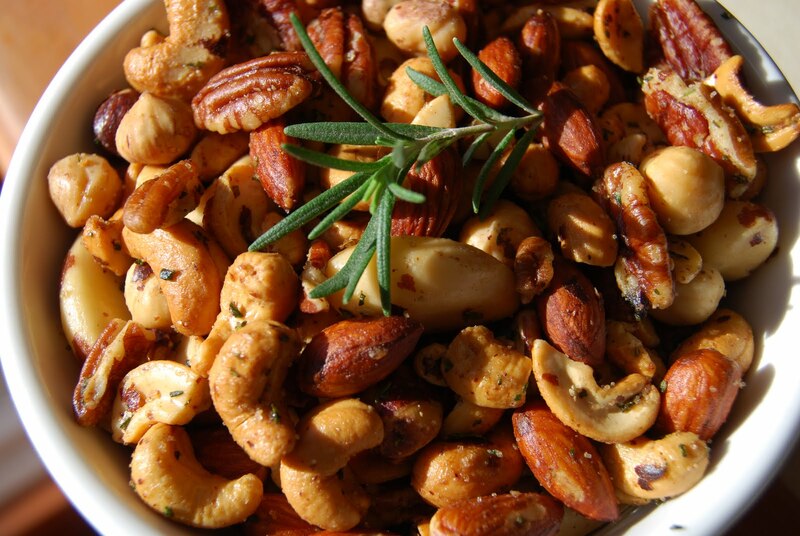 1st: Roast some mixed nuts in the oven. 2nd: Melt some butter and mix together with dark muscovado sugar, salt, cayenne pepper and finely chopped rosemary. 3rd: Mix the nuts into this butter mixture. These nuts are so ridiculously moreish, you will come up with all sorts of reasons to make these again and again and again! My pièce de résistance was Chilli Jam. I made it with the intention of giving away food presents this year (last year at time of writing!) but could not find jars small enough to be able to make a good batch of them. So I ended up just making 3 x 500ml jars; keeping one for myself and giving the other two away as presents. 1st: Place 1Kg bag of Jam Sugar into a saucepan and pour over 600ml of cider vinegar. 2nd: Warm through until the sugar dissolves. 3rd: Deseed 150g of red bell pepper and 150g of red chillis and place into a blender. Blitz until finely chopped. 4th: Add to the saucepan and bring to the boil. Boil for 10 mins on a very high heat. Allow the mixture to cool for about 40mins without stirring. As it cools the jam becomes more viscous. Place into sterilised jars. Enjoy! I made this again during December, this time for my brother and sister-in-law whilst staying at their house over the Christmas holidays but was requested to make it hotter, so therefore added a few birds-eye chillies into the mix as well. Whilst the sweetness and chilli taste was still there there was an increased tingle on the lips and at the back of the throat. WARNING: Whilst cooking, the boiling birds-eye mixture made my eyes water and made me cough incessantly. My face (unintentionally) received a chilli steam facial which was sore for a while after. Oh and the rest of the house complained about the vinegary smell. 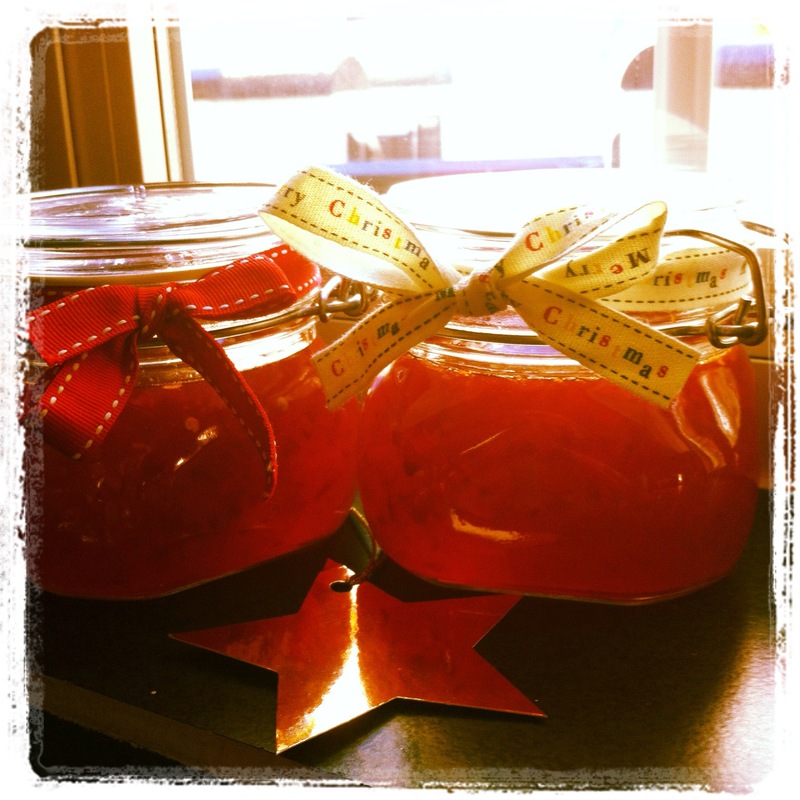 Nigella is for life, not just for Christmas!